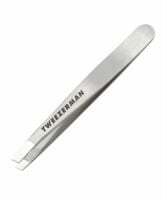 Tweezerman does a superb job at creating such deft, faultless tweezers that nary a hair can hide. They are so sharp, in fact, that my one complaint is that a little too much pressure can result in tiny scars. As much as I do love these, I prefer Revlon's version, as it is a tad more gentle to my skin. These are the best tweezers I have ever used. They get to every little hair and last a long time. Love these. I love these tweezers so much, they rock! They work so well because they are tweezerman and are a great bargain for such great quality.